Ramesh Sippy’s cult classic SHOLAY has added another feather in its all ready packed cap by becoming the Numero Uno film of All Time Classic in a poll conducted by London’s prestigious global media group Time Out. Interesting despite the generation gap K Asif’s MUGHAL-E-AZAM (1960) and Mehboob Khan’s MOTHER INDIA (1957) did not lose their shine and were placed at number two and three position respectively by the distinguished jury consisting of top 30 Bollywood experts across UK, US and India. The surprise package of the top 10 list is Shah Rukh Khan and Kajol’s love story DILWALE DULHANIA LE JAYENGE (1995) acquiring fourth position ahead of remarkable classics like GUIDE (1965) ; DEEWAAR (1975); and PAKEEZAH (1972). Guru Dutt’s hard hitting social drama PYAASA (1957) features at fifth position and Manmohan Desai’s commercial masala potboiler AMAR AKBAR ANTHONY (1977) squeezes into the top 10 list at position 10. Yash Chopra was crowned as top director, responsible for the success of six of the films that have made it into the Time Out top 100: 1975’s ‘DEEWAAR’ (7), 1976’s ‘KABHIE KABHIE’ (77), 1979’s ‘KAALA PATHAAR’ (36), 1981’s ‘SILSILA’ (28), 1997’s ‘DIL TO PAGAL HAI’ (21) and 2004’s ‘VEER ZARA’ (97). Amitabh Bachchan emerges the only actor to have his 15 films in the list of top 100 movies, including three of his films winning place in the top ten list viz. 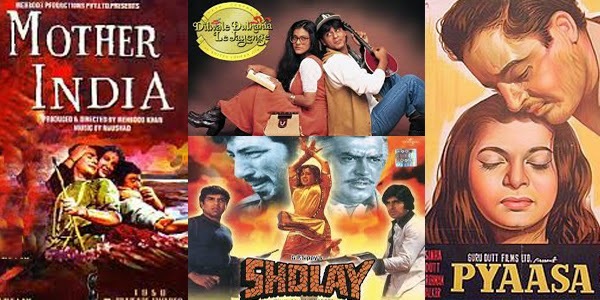 1975’s ‘SHOLAY’ (1), 1975’s ‘DEEWAAR (7) and 1977’s ‘AMAR AKBAR ANTHONY’ (10).